Large pull-thrus and easy interior roads. No rig is too big! Easy access off I-40 plus free coffee and donuts in the morning. Heated indoor pool, hot tub and sauna. Our friendly staff is ready to welcome you! Convenient location, check in was easy, offered treats for our dog. Lead to our site. Used shuttle to the Big Texan. Great facilities. Am going to stay here again. 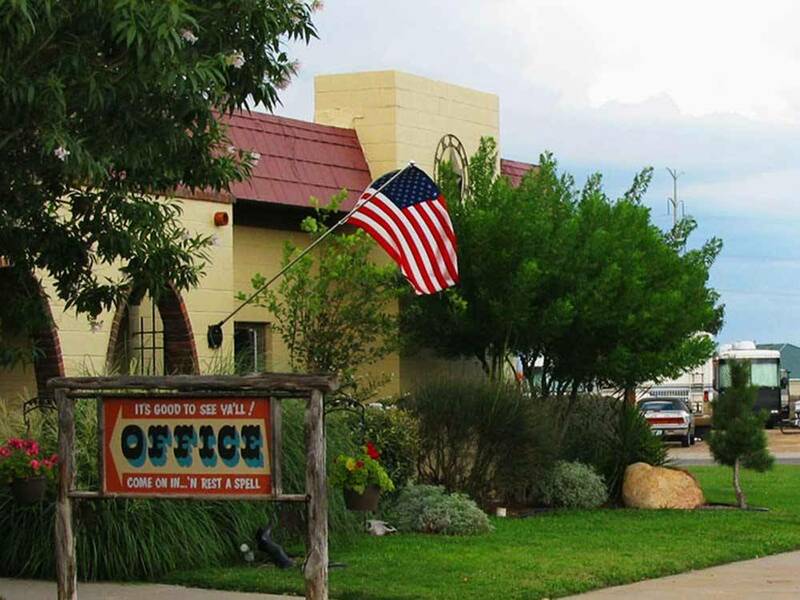 We stayed here for 3 Nights while visiting the RV Museum in Amarillo and the Canyons. The Park was accessible off the freeway once we got used to the one way frontage roads and the GPS didn't understand the one way frontage roads. The site roads could stand some work and the sites were easy to enter but mostly dirt with some gravel and a little unkempt grass. I appears from the age of the park at one time most sites were back-in so to accommodate larger RV's and pull through's they utilize the open areas to extend the sites. The store and rest rooms were clean and well stocked. We enjoyed the enclosed heated pool. We would stay here again if in the area. We had a one night stay here. Easy in and out. Check in and staff were nice. Nice dog park. Restrooms were very clean. Gravel site mostly level and we did not unhook. We would stay here again. Second time we've stayed here. Nice people. Roomy. Good sized dog park. 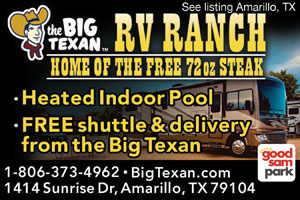 Free transportation to their nearby Big Texan steakhouse restaurant (just down the road). We'll stay here again next time. Registration was easy. Site was mostly level, though there was some freeway noise. We didn't have the right fitting for their sewer connection so I didn't use that. Lots of dumpsters. We took advantage of the free limo ride to the steakhouse and had a much better meal than expected. Easy on and off so would probably stay here again. Very nice park. Clean and efficient surroundings. Great staff and lots. Spent one night and enjoyed the full hook up pull through. Weak wifi so we had to use phone hot spot. Some expressway noise. Would stay there again. We stopped here because we had seen the "Big Texan" a few times on TV. :) The Staff at the park was very helpful and cheerful. The site was level and very easily accessible. The park is very clean and the pet area nice - and clean. The complimentary limo ride to & from the Big Texan was a nice surprise. (If you are not towing you can get anything on their menu eat in or "to-go" - another nice surprise) The wi-fi was good, the clubhouse nice. Access to the Interstate coming and going is easy. Highly recommend this for a restful stopover. A great place right off I-40 with no highway noise. The best wifi of any campground we have been to. Most short stays of less than a week were in very large pull through sites. All sites are gravel, water pressure was on the high side and our sewage connection was elevated 6 inches above ground which required walking the hose (always fun). This is okay for a short stay. Sites are crowded together and gravel, but fairly level. Decent wifi, clean showers with good water pressure, friendly and helpful staff. I did enjoy the hot tub and indoor pool. It's easy on-off for I-40. Planned this stop months ahead of time on our family trip west. Booked based on the comments and reviews. Was everything that was expected, Wi-Fi not available at site,but we were located close enough to clubhouse that a short walk was all that was needed to have internet access. VERY windy during our stay, which is apparently normal for the summer time in this area. Used the limo service to take advantage of the complimentary ride to the Big Texan Steak House, that was well worth the trip, and is a must do for anyone passing through. Someone actually ate the 72oz steak while we were there. Very entertaining, my daughter still talks about they guy eating the whole meal to this day. Awesome steak and meal had by entire family too. Set up of park a little tight but we had no problems pulling our 40' 5th wheel through park. We just walked and mapped out the best route out of park so there would be no issues when leaving in morning. Easy on and off of interstate. Highly recommend, and would stop here again. Very easy to get to, clean, friendly, great pool. Limo service to the steakhouse was great. Would recommend. this facility is very run down and not up to Good Sam standards. Roads are full of holes, cable TV does not work, WiFi is in operable except in office, grounds are dusty and shows signs of decay. Office staff is barely friendly and not open to complaints. Would not recommend to any travelers. Fine overnight stay. However, this is one of the most odd park layouts I've seen. The pull-thrus are back to back with an 'alley' like road between them. The problem is there are transformer boxes and vehicles parked in the alley so I don't understand how we were expected to 'pull thru' and exit. We arrived after the office was closed and before they opened, so in fairness to the park, we did not have the opportunity for instruction. If the campers in front of us had not moved in the morning I don't know how we would have gotten out of our 'pull-thru' without unhooking our toad and backing up. Otherwise a fine looking park. Easy on/off from freeway and plenty of space to park and slide for the night. We were very disappointed that there is no WIFI in the park nor is there cable hook up. The brochure shows both. We were not told this when we checked in and even got a WIFI password but you have to go to clubhouse to use it. The brochure shows 95 channels but again go to the clubhouse to use it. I was here for 1night. While the common facilities looked nice, that is where the appeal ended. The site was just gravel and weeds. Side-by-side hooks put only about 3' between my unit and the next. I noted that they attempted to put 2 other travelers in the next site, but they objected to the close proximity before the 3rd took it. I was told that wifi was only available in the office building for overnight guests. I don't think I would stay here again. Lovely campground, but not quite a 5. Spaces were good sizes; nice dog park and grounds were well kept. Bathrooms were clean but worn. Cable worked, Internet did not. Staff showed us to our site which was very helpful. We'd readily go back again! Bathrooms had 3 showers, 3 toilets, and 2 sinks. There was an indoor pool, hot tub, and sauna in excellent condition. Park was in excellent shape. Pull in sites gravel pads. Water, elect, and sewer connections excellent. Wide RV spacing. Nice laundry room. Cable and wifi available. Free donuts for breakfast. Staff was courteous, friendly, and knowledgeable. We stopped in for one night at the start of our two week trip. They had a space available for us, pulled through, set up and done. Staff was really nice, checked us in even though they were just about to close. Was hoping for a ride to the big Texan for dinner but the service was over for the night, it was late so we just missed it. Campground is nice, bathrooms were very clean and the water park right next door is a plus. Too bad we only stayed one night, now we know. We would stay here again if given the opportunity. Seems like a fun spot!